Terry here and it is hard to believe we are already into October and it is my turn to be your guide, so here we go. For this challenge of "Heavy Metal" which will run two weeks, it is not about music, or I suppose it could be, but the idea is to share your "Heavy Metal" love of Tim and his products. 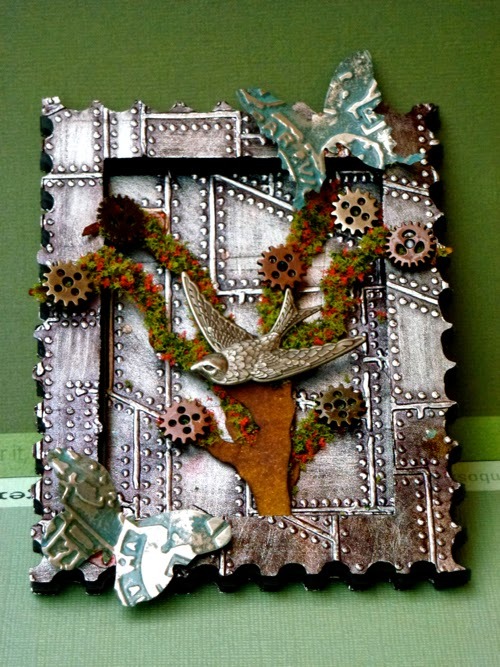 This can be altered or not, metal pieces (Idea-ology), foil backed paper, metallic paints or stains. Pretty much anything with metal in it or any form of, but obviously keeping it in a Tim style. As always for the winner there is a £10 shopping voucher from Country View Crafts our generous sponsor and three Pinworthies, who can proudly display a badge. 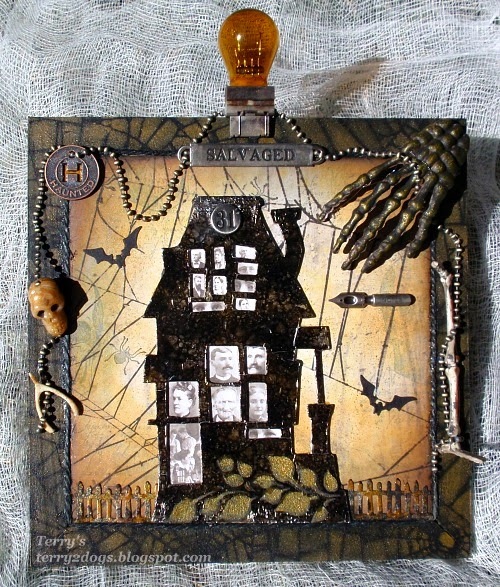 I love altering items that you just can't seem to let go and I love Halloween, so I decided to add some "Heavy Metal" in the form of stains, paints, alcohol inks and metal bits to this once framed tile! For all the details of my madness, please visit my BLOG. I love working with metal sheets and embellishments and I especially love rusting things so it'll come as no surprise that my 'Heavy metal' project is full of rusty bits and pieces. Vintage and grungey with lots of Idea-ology, this wall hanging was great fun to make. More details and pic's of how and what here. I love using metal on projects and I have used all of the items Terry has suggested, with the exception of the Heavy Metal Music! I thought it was a good opportunity to start making cards for Christmas. Full details are on my blog. I have used both alcohol inks and distress paints on embossed metal foil to create my frame and flowers. I love this effect! Do pop over to my blog for additional photos and the details. Heavy Metal, yes please! I'm so happy that our host, Terry, chose Heavy Metal for this challenge. 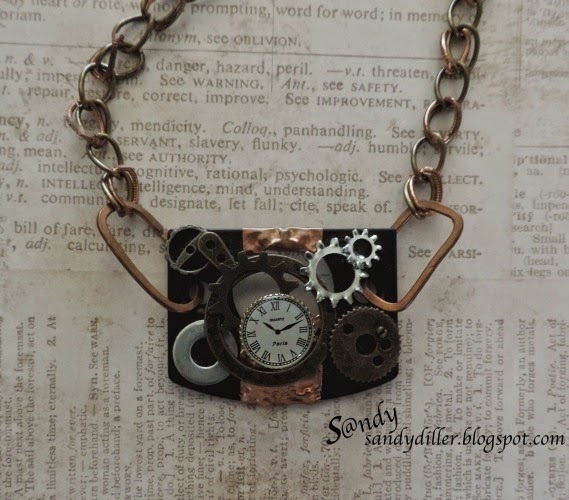 I love to use my paper crafting supplies in different ways - especially for jewelry and definitely a ‘Tim’ influence with the clocks, gears and his embossing folder on the copper. This is my take on a project I first saw from Susan Morse in Cloth, Paper, Scissors Magazine way back in July/August 2010. The base for this piece is a striker plate. If you don't know what that is, please stop by my bog here for more details and photos. My tag today started off with just the lower half where I ran some copper foil through Tim’s spiderweb embossing folder and it went from there. 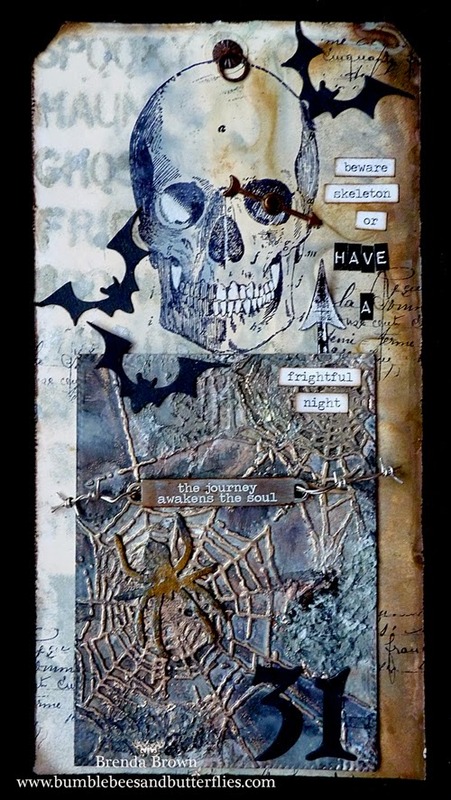 There’s really heavy metal on this piece where I even made my own barbed wire and I used metallic pastes, distress paints and the very new distress spray stains. Now that you have been inspired by the fabulous artwork of my lovely teammates, we hope that you will join us in your "Heavy Metal" projects and you have until Thursday, October 16th, 18.00 BST. Amazing samples from the team! You have all rocked the theme, brilliant, look forward to see all the details! Oh wow - what fantastic inspirations oft the designteam !!!! Incredible artwork from my talented teammates! What a great variety and mix of metal inspiration for challenge travelers! Can't wait to see all the projects! Happy Weekend to all! WOW! What a Fabulous set of Heavy Metal creations by all of you Awesome Creative Guides! There's home décor, cards & tags and a necklace, too! Just WOW! Thanks for the heavy metal inspirations, Ladies! 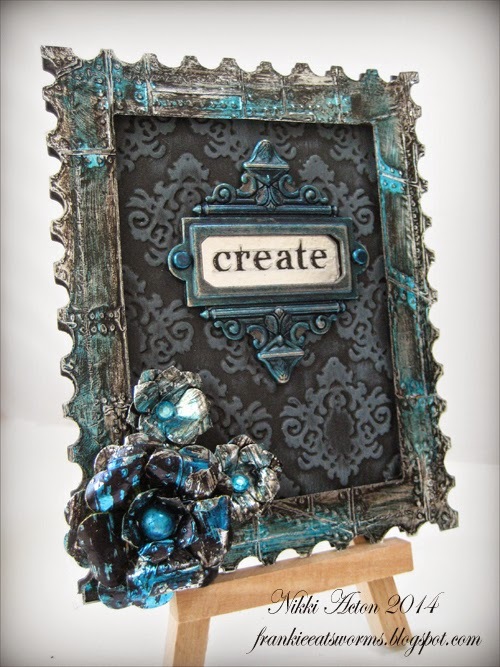 XOXO-Shari T.
Fabulous Creative Guides inspiration and great challenge ...will be back later to play. Great ideas from the team for this new challenge! Let's play! Thank you so much for giving us the chance to follow "Tim-Style" challenges, what a lot of fun! And thanks especially to the wonderful design team who offers so much inspiration! Oh my... Dear design team... I made a horrible mistake. I have and always am been following Tim's instructions according to the Compendiums of Curiosity. But this time I made my entry here before carefully reading the instructions. I have not fully explained in what way I follow Tim while writing my post. 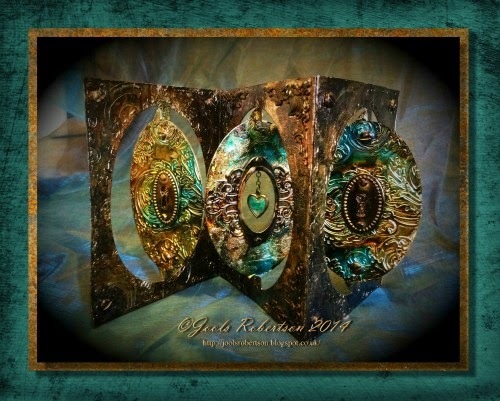 Please delete my entry (Steampunk Gipsy Queen) as I am aware I did not fully observe the rules.. Please, accept my apologies. The next time I will be with you with all regulations in my mind. Excuse me!